To access Team settings, go to Settings and click on the "Team" tab. Note: Team settings are only available for the PRO subscription plan users. You can find more information about our subscription plans here. In the Team menu, you can see staff members, who have the access to your Oberlo account and their privileges. To add a new team member, click "Invite People". From the dialog, add new team member's email address and select the access level. 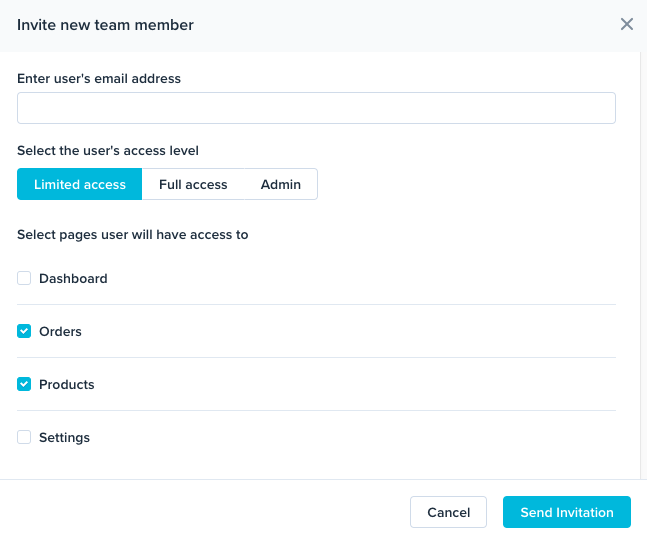 You can give your team members Admin, full or limited access to Oberlo , for example, only "Orders" page. Note: You will not be able to send the invitation to the email address which already has the Oberlo account assigned to it.